We stand before each other in our underpants, each holding a Primitive Axe and eyeing each other’s beards. I inch a step forward, as does he. I inch backwards again, distancing myself from his thatched hut; he mirrors me. Then a third player in Chitin armour turns up from behind him, cheerily says “hello” in public voice chat, and shoots the other player dead with a Simple Pistol. Want more out of your survival experience? 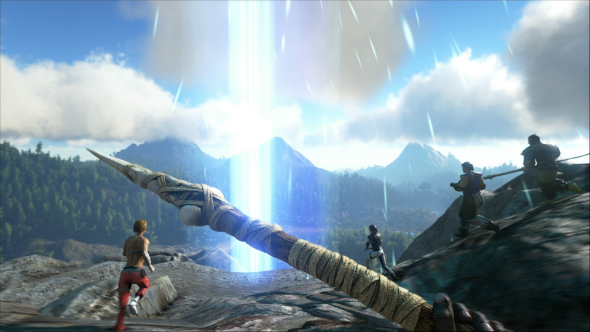 Here are the best Ark: Survival Evolved mods. Relieved, I use the moment of chaos to make my escape, running off along the coast, past countless half-finished wooden and stone houses and two lolloping Triceratops. But there’s a hitch to my plan: a poison-spitting Dilophosaurus – of the very same genus that spelled Dennis Nedry’s downfall in Jurassic Park – has spotted me and races forwards, spitting its blinding toxin. Sightless and severely injured, I stagger defeated through the prehistoric undergrowth for a few more yards before being knocked unconscious. Through some stroke of luck, the Dilophosaurus gets distracted by something, and leaves me to stumble in peace. Watching the Torpor meter rise in a state of unbridled angst, I somehow survive the next 30 seconds and come to my senses, smashing cooked meat into my mouth as fast as it can be chewed in order to regain some health. Time passes by the beach. Later that same day, a stranger approaches my campfire and says ‘don’t worry I’m friendly’ before emptying an inventory full of valuable high-level items at my feet and walking naked onto my fire. ‘You can have them’ he says, moments before burning to death. And now I have to make sense of all that and slap a score on it. 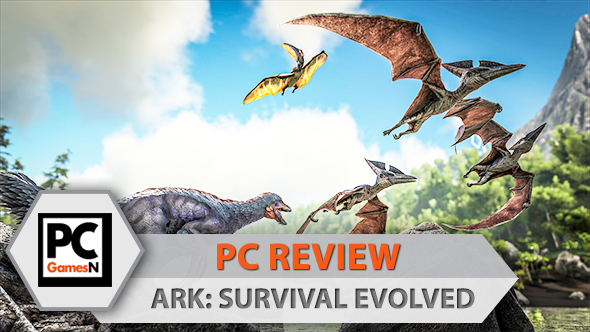 Here goes: Ark: Survival Evolved is a great many things, all of them absurdly ambitious, and none of them particularly polished. Evolution sim, survival game, PvP combat arena, sandbox, single-player adventure, and mod hotbed are all part of its repertoire, although frankly I wouldn’t be surprised if there was a decent racing game in there somewhere too. It’s also that rarest of modern-day gaming phenomena: an Early Access game that actually got a final release. As such, a critical discussion about it needs to take a different path than usual since a) it’s already made Warren Buffet levels of money, and b) it doesn’t really have a fair comparison point. This kind of full release is so rare for a survival game that the industry hasn’t actually decided what it should look and play like once it’s finished. For example, my first unforgiving and death-peppered hours in Ark were spent thinking to myself, ‘boy, this game does not care about guiding new players’. The ‘survival guide’ in the main menu is a flimsy text-and-images gesture towards acclimatisation, and absolutely everything I learned about crafting, combat, taming, the ecosystem, and console commands came from Wiki pages and other players. Killed on the way to finding my previous body and picking up the precious few resources I’d gathered. Killed by ferocious, high-level, tamed dinos set upon me by a local tribe for no reason. Killed, killed, killed. But is this a failing of Ark itself? You could argue that dependence on Wiki pages and helpful community members is just a genre convention of the Early Access survival game at this point. The same is true of its inherent mechanical clunkiness, which rears its head during every melee combat scenario and dino ride. Imprecise hit detection and environmental clipping are noticeable, but only feel genuinely detrimental when you lose a fight. As irritating as those moments are, you get the sense that rough edges like this just sort of… come with the territory. That doesn’t mean it’s entirely forgivable. 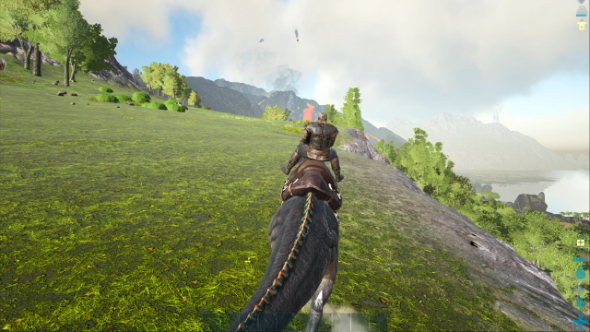 The absence of a more elegant early game experience or mechanical polish elsewhere doesn’t excuse Ark’s unfriendly learning curve. But it matters less than all the good times it brings – and has probably already brought – at this point. Interactions between players and ecosystem that leave you desperate to tell someone, anyone, what just happened. This is the best thing about Ark. Better than riding a Tyrannosaur (probably everyone’s chief initial motivation for playing), and better than the strange and wonderful transition it makes from prehistoric survival to something more overtly sci-fi as you progress through higher levels and engrams (‘Who’s that guy in the shiny silver exoskeleton?’ You’ll wonder, hunched over a campfire, making a cap out of a Dodo’s hide). Anecdote generation capacity, we’ll call it. It’s as if you’re caught up in a Frank Zappa retelling of Robinson Crusoe, and just as you reach the precipice of some grand self-directed objective like building a home or taming a carnivorous dino, the wild’s own narrative tramples all over yours. Resources lost, progress vapourised. Ark’s ecosystem always wins. What a complicated ecosystem it is, too. The dinosaurs aren’t a carefully deployed jump-scare device, they’re absolutely abundant. Generally, the more vicious and high-level dinos hang out towards the centre of each map, while low-level pests and friendly herbivores populate the periphery. Buzzing, flying, crawling, and swimming in among them all are the insects, sea creatures, prehistoric birds, and mammals. Everywhere you go, there they are. Stomping around, defecating, and eating each other. They’re all tameable and breedable too, which gives you a feeling of real agency after countless hours of being hapless prey. It isn’t so much getting around on a dino’s back that proves so enjoyable, but the memory of your many, many previous failed attempts while you do and the accompanying sense of achievement. 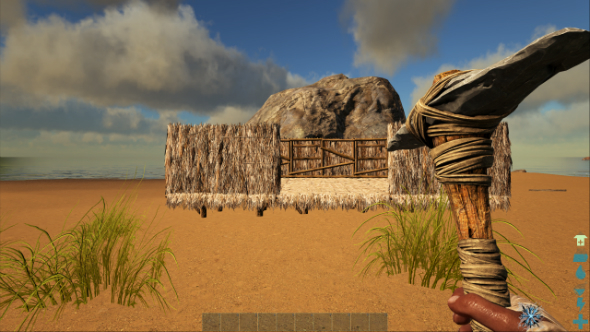 Now on the property ladder, Ark offers you numerous other means of progression. It might be forming or joining a clan, and then wreaking revenge on those guys who used to brain you with their superior weaponry back when you were a rookie. But if PvP feels like dipping yourself in acid, it might be investigating the beacons dotted around the island, and summoning bosses instead. Or perhaps breeding a family of impossibly dangerous raptors; your own personal limo service. You’re free to pursue these goals in perpetuity, hampered only by the hostile environment and the whims of whoever runs the server you’re playing on (give PvP servers a miss for your first few games). Before you know it, you’re that impossibly powerful guy in Chitin armour carrying an actual firearm, with a tame Velociraptor and a castle. 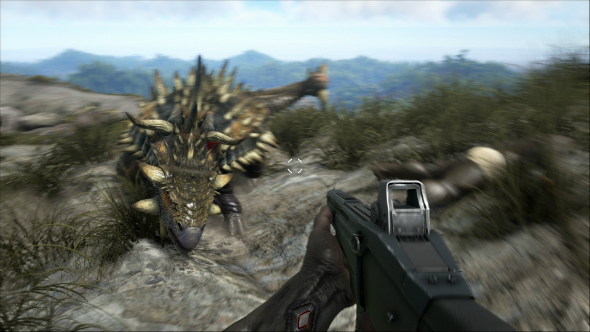 In the end, Ark’s ambition pulls it in the right direction with more force than its clunkiness tugs it the other way. It’s always more enjoyable to spend time with a game that tries something new and exciting, stumbling along the way, than a game that tries to tick focus group-inspired boxes. If that game also happens to simulate an entire prehistoric ecosystem, and produces bewildering emergent scenarios like clockwork, all the better.